The first mosque that came to our attention was the Keriya Aitika Mosque, located here. We already know the exact location as the activist who posted about this mosque helpfully included the coordinates in his images. The two images that the activist posted from Google Earth clearly demonstrate that the building depicted has been razed. 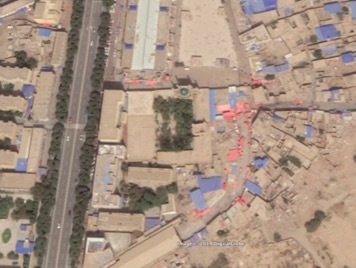 A Google image search using the terms “Keriya Mosque, China” makes clear that the location depicted is the northern gatehouse for a mosque. The main prayer hall appears to be a large rectangular building immediately to the south, documented in this Flickr album. 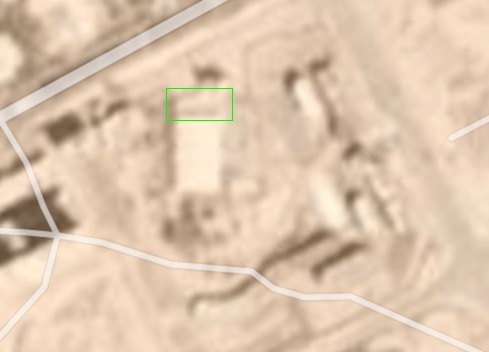 There is a smaller building between the large building and the gatehouse, which Google Earth indicates was built after March 2014. 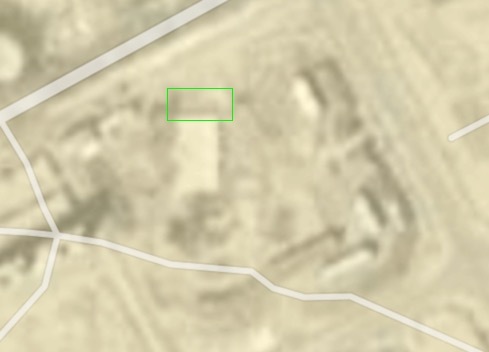 Although the original poster has already used Google Earth historical imagery to show that the gatehouse has certainly been destroyed, we can use Planet Labs imagery to narrow down exactly when this took place. Planet Labs imagery is usually of much lower resolution than Google Earth, typically three meters per pixel rather than 50 cm or 30 cm per pixel, however the imagery is taken more regularly. Below is a comparison between this location on the 19th (left) and 20th (right) of March 2018, using Planet Labs imagery. We can see that the gatehouse seems to disappear. It is therefore apparent that there has been a change between March 19 and 20, focused on the gatehouse. 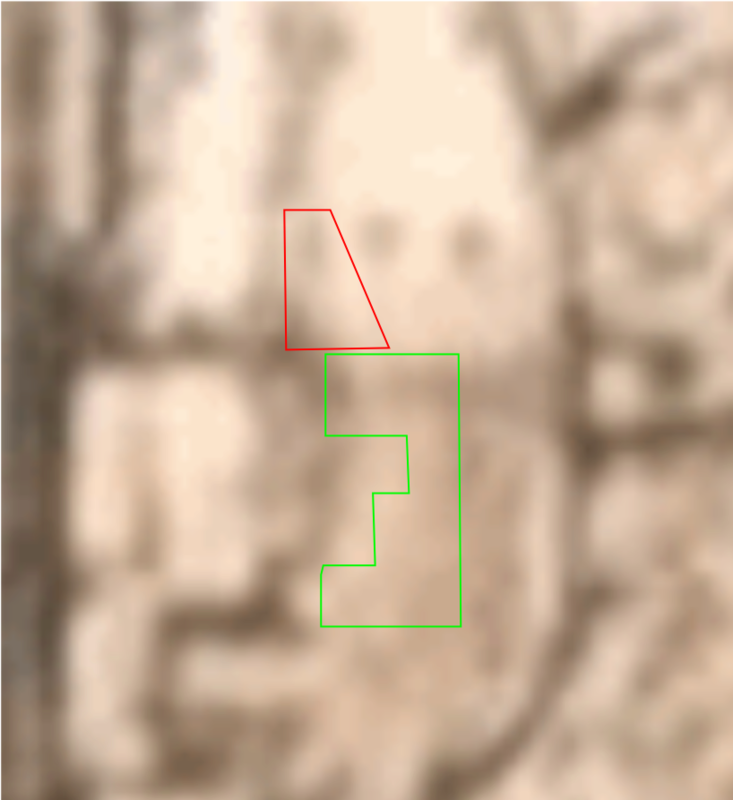 In the slider below comparing the two dates, we can see that the building immediately to the south of the gatehouse has also been completely removed, although the larger rectangular building to the south, which we believe to be the prayer hall, appears to be intact. A second user on the original thread on this subject asked about the Kargilik Mosque and whether it had been razed or not. Finding the exact location of this mosque is a little harder, but not by much. Simply by typing “Kargilik Mosque” into Google we find that the first result was a place in the collaborative mapping service Wikimapia. 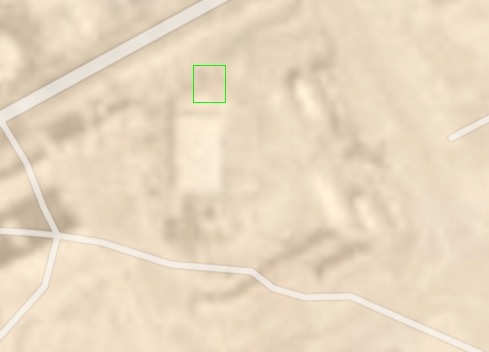 By comparing satellite imagery of this location with other images we found of this mosque, we can confirm that this location is correct. Looking at publicly available imagery on Google Earth we see no obvious changes to this mosque. This is because, at the time of writing, the most recent available imagery on Google Earth was from September 1, 2018, when the mosque was still standing. However, using Planet Labs imagery we can see that there was significant change at this location in late 2018. Using the Planet Labs imagery we can can see that something big has happened, but it’s not possible to be sure of the exact extent of this change as Google Earth has no up-to-date imagery. However, recent high quality imagery can be leased from TerraServer, which shows the extent of the change in much higher detail. As we can see from the comparison below, a large portion of the mosque complex has been removed, including the impressive gatehouse. It is already clear that there is systematic repression and imprisonment of the Muslim Uighur minority in Xinjiang, and the destruction of cultural and religiously significant Islamic buildings in this province may be a further part of this ongoing repression. 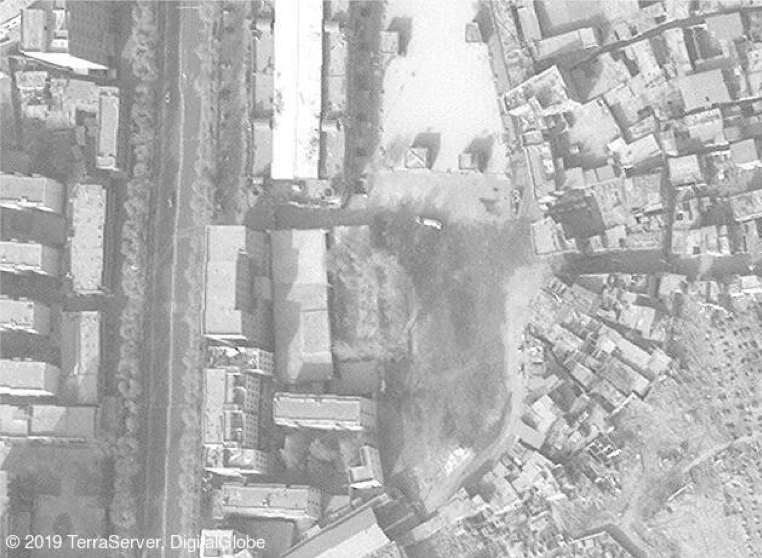 Commercial mapping and satellite imagery services will be important tools in tracking such events and identifying if the destruction of such buildings is systemic or not, especially in a region where access can be difficult. It’s obvious that a wholesale effort to eradicate the entire Muslim culture is underway, with untold human suffering tne natural result. Seems like that is ok with the wider Moslem world. This is fake news, just nonsense and is not true. The author has made an assertion, backed up by evidence. You have made an argument against this, but provided no counter evidence. That which can be asserted without evidence, can be dismissed without evidence. Rule 1 of Logical Fallacies. It may well be ‘fake news’ in the sense that there may be a perfectly mundane explanation for the buildings’ demolition. At this stage we have no idea if the Chinese government was even responsible. 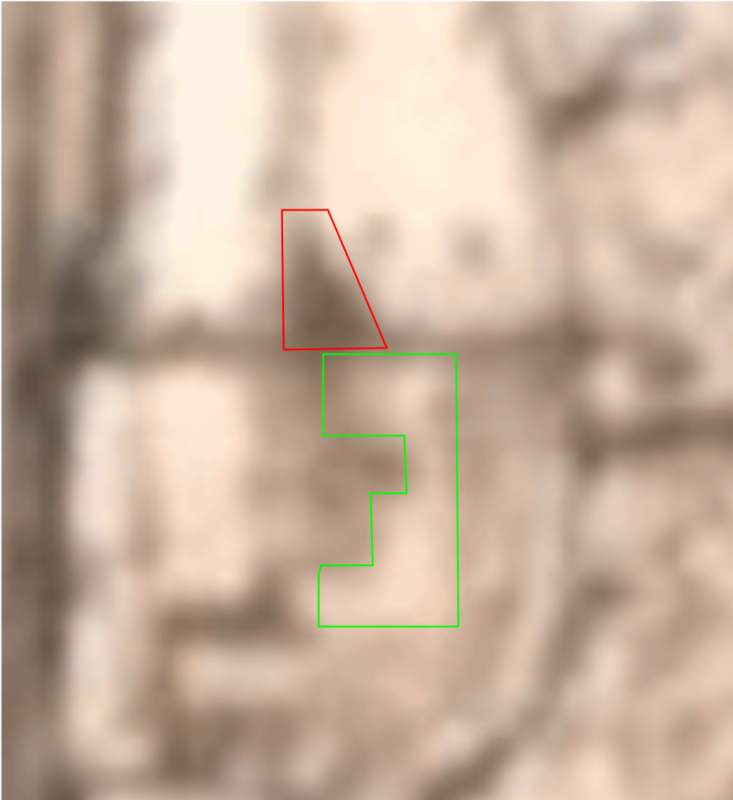 All bellingcat have done is verify something that didn’t need verifying anyway, the disappearance of the buildings, which nobody has disputed. So what you saying is the Chinese government is not responsible for disappearance of two huge historical buildings! Who else might do that?an angery customer? Obviously Peter just did a short trip to China to check the facts, show us your pictures from yourself Peter reading yesterdays paper in front of both of them. Do not be surprised to see some chinese trolling in these comments soon. So the gatehouse at the Keriya Aitika Mosque was demolished but the much larger main prayer hall remains intact? Hard to draw any conclusions from this but it doesn’t seem it’s about eradicating Islam in eastern China. Maybe the gatehouse was damaged in an earthquake or just found to be unsafe. Apparently the demolition was discussed in Chinese media. Would be helpful to know what was said. *Western China I should have written of course, not eastern China. What the world and the media should cover is infiltration of separatists from the neighbouring countries, as well as how they plan to achieve their goals. Mosques could be the warmbed for such acts. Well, schools could be the warmed as well. Blow them up! More seriously, instead of making any sort of serious comment you want to deflect criticism away from a very repressive regime with little legitimacy, one which systematically trey on the rights of its citizens and does it as policy. Why not deal with what is actually happening. Instead you talk about ” infiltration of separatists from the neighbouring countries”. Evidence? Which neighbouring countries? China has also systematically eradicated Tibetan culture and temples. If China will rule the world, no Christian and Catholic churches any more. No Indian temples. Thats good news, i don’ t like mosques. Well, people don’t like you either, that doesn’t mean you should be run over by a bulldozer. They appear to be using the Tibetan playbook. You will notice the two images of Kargilik. One pre and one either post or doing the current onslaught. Look at the banner, the encroachment on all sides the placement of some tin box pop up food/tchotchke shops directly in front. Of course it *could* all be innocent. OF course it could. This is how it began and continues, now getting worse by the day in Tibet. Truly an evil regime, this is the Neo “Cultural Revolution”, just as Mao bleated about outside “Capitalists” to stir up the othering of those the dictatorial classes did not want oppressed and murdered by the thousands, this is the enemy du jour. Much more needs to be done on this. It’s great work by @NickWaters, but there must be more concrete ways to establish mal-intent by the Chinese government. These mosques could quite possibly have been destroyed for reasons other than ongoing anti-muslim efforts in Western provinces. We know, however, that the Chinese have done such things in the past (Tibet). Any more work on this would be great. I’m afraid all we’re going to achieve right now is a dangerous stoking of the flame. whoever believes in this is a complete idiot. People are still visiting and taking pictures of the mosques as we speak, you can find travel posts on social media. First of all, if you wanna write about something happen in China at least take a trip and see for yourself, backing your point with satellite images is ridiculous and high unprofessional. Besides did you really think china was gonna destroy their own historical buildings just to eliminate religious freedom…Think about the forbidden city, it’s a symbol of monarchy, if there’s anything China wants to destroy, it would be the first. Instead it was listed as historical building and was protected, just like the mosque. Okay, share those images from social media then.